We are entering the summer fire season, when everything becomes tinder box dry and all it takes is a spark to set in motion a wildfire that can wipe out acres and acres of trees and homes in a short amount of time. Last summer we saw the devastation of such an event in the eastern part of our state. If caught in time, fires can be extinguished. If not, they soon become a raging, out-of-control inferno. It is also time when families take summer vacations, kids get grumpy, parents are stressed to the max and the well of patience has dried up. Even minor irritations become tinder boxes ready to ignite. 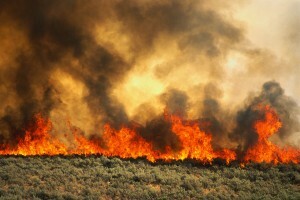 Once a “wildfire” begins, it quickly feeds upon itself. Anger can become a habit. But like any habit, it can be replaced. We can easily become addicted to anger as our first response to situations. We are the ones who decide whether to get angry or laugh, problem solve or walk away. 1. Triggering event: Some event triggers a reaction from us. It might be gestures, profanity, disrespect, bullying – anything that we perceive as emotionally threatening in some way. Within families it is that immediate reaction to a child’s temper, talking back or ignoring the rules. We can change our response at this juncture. 2. Warning signs: emotional and physical. Identify the other first response emotions you are experiencing. Some of those first feelings might be feeling hurt, anxiety, threat, fear, surprise or a combination of emotions. They often go unnoticed, but we can train ourselves to become aware of them. Go back to other times when you got angry. What were you feeling before that anger kicked in? What were you saying to yourself? Physical signs include tightening of the jaw, change in breathing, inability to speak slowly and distinctly, altered posture, intense eye contact, facial tics, and flushed complexion. Ask those around you if they see these signs. Then become aware of them yourself. 3. Thought patterns: feelings don’t happen on their own – they are a response to our interpretation of what is happening. Ask yourself, why am I getting so angry? Is this incident worthy of this anger response? Is there another way to solve the problem? Has anger worked for me in the past? If not, what did I want to accomplish that my unchecked anger prohibited? We can choose to maintain our self-respect, develop the courage to say to ourselves, I am going to engage in a positive way or I will choose to walk away. It takes courage to walk away. Courage is defined not just as the ability to conquer fear or despair, but choosing a course that is not easy but requires caring and a purposeful decision. 4. Battle signs: When we have reached the battle stage, we are in fighting mode. We gear up to destroy our enemy and to defend ourselves. The problem is the battlefield is our families, homes, places of work, and the communities we live in. The enemy we kill is our loved ones. 5. Engagement: As we engage with anger, we lose control of our emotions and what is happening. Anything goes – we are no longer in control of what we are doing. 6. Consequences: When anger has spent its emotional power, we can see the devastation it has produced and those who have been wounded. Sometimes the wounding can be fatal in terms of our relationships. When we choose our responses, we choose their consequences as well. 7. Recovery: The battle is over, emotions calmed down. We have an opportunity to examine what has happened. If you take time to do an assessment and are really honest with yourself, you will be able to answer the following: Did I accomplish what I wanted? 8. The same old way: If we do not assess the consequences, we will continue the same pattern over and over again. The cycle continues. Only the fallout gets worse. We can change directions, replace habits, and discover different ways to resolve problems by recognizing our patterns of response to events, asking some pertinent questions and then taking time to prepare ourselves for different responses.